UNDERDECK WATER PROOFING HAS BECOME THE MUST HAVE FOR BOTH EXISTING AND NEW CONSTRUCTION DECKS. AT WEBB FAMILY CONTRACTING WE CUSTOM FABRICATE OUR UNIQUE DRAINAGE SYSTEM FOR YOUR PROJECT. MOST SYSTEMS ON THE MARKET USE THIN RUBBER MEMBRANES AND A LOT OF TAPE AND CAULKING TO WATERPROOF UNDER DECKS. OTHERS USE FLIMSY PLASTIC HANGING CEILINGS THAT ARE INTENDED TO ACT AS BOTH THE WATERPROOFING AND THE FINISHED CEILING. 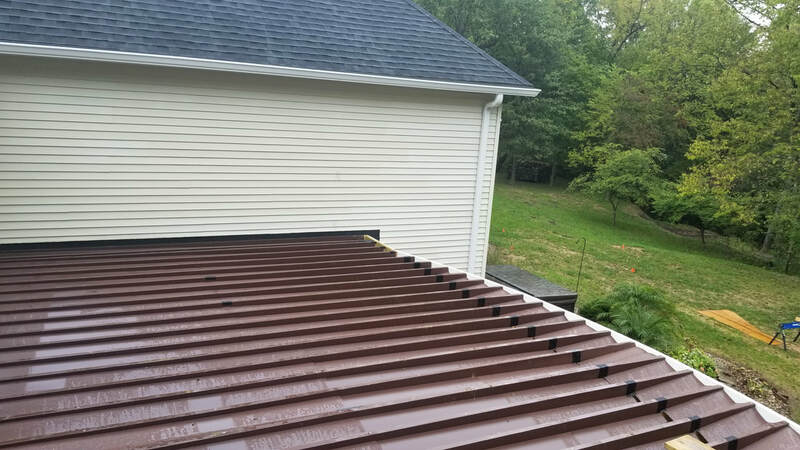 AT WEBB FAMILY CONTRACTING OUR CUSTOM UNDER DECK SYSTEM USES COATED ALUMINUM TO WATERPROOF AT THE TOP OF THE DECK ALLOWING THE NECESSARY PITCH NEEDED TO PROPERLY DRAIN WATER TO THE GUTTER SYSTEM. THIS INNOVATIVE PROCESS ALLOWS US TO INSTALL ANY MATERIAL AS THE FINISHED CEILING AND MAINTAIN A PERFECTLY LEVEL & WATERTIGHT SURFACE WHERE WE CAN SAFELY INSTALL CEILING FANS, LIGHTS , SPEAKERS AND MUCH MORE.